Halloween costumes need no introduction when they are THIS AWESOME! 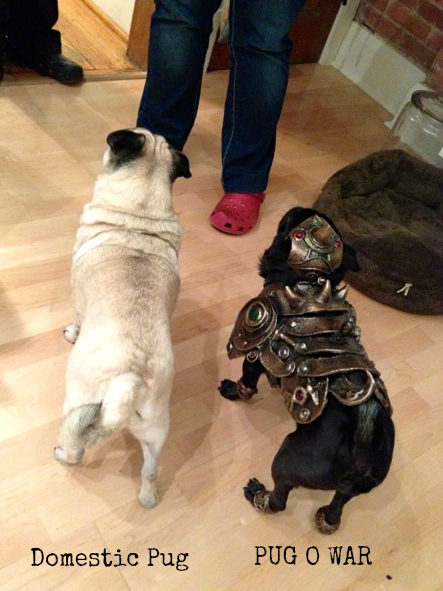 Thank you, Merry, for lending Lola your wicked battle armour, and WATCH OUT NEIGHBOURHOOD! 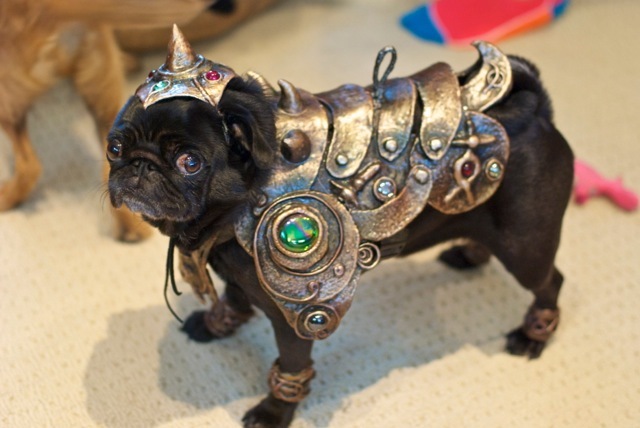 Lola Pug is armed and READY to face any ghouls and goblins that come our way! I lOVE your costume Lola. You are so bad –s! Lola, that costume rocks. Now, just channel your cone glare instead of looking pitiful. We are 100% sure you will get a lot of extra treats for wearing this. I LOVE it. You rock that costume like there’s no tomorrow. Oh, Lola, you look mighty fierce in your costume!!! You have much more patience than I. Demand LOTS of treaties!! !